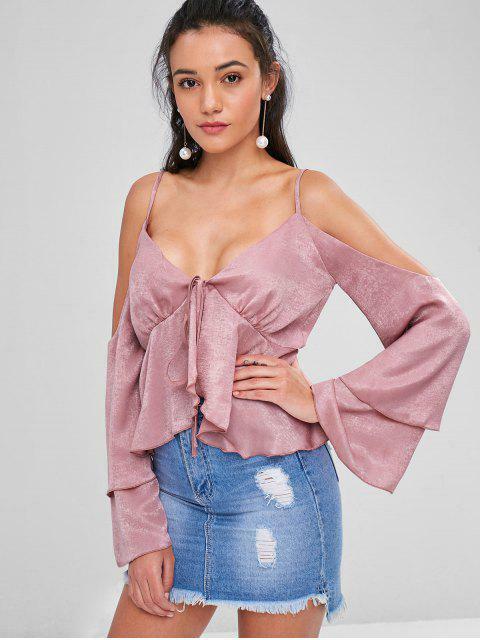 [44% OFF] 2019 Cold Shoulder Flare Sleeve Blouse In LIPSTICK PINK | ZAFUL ..
Kam nicht an , stattdessen 2 hässliche und viel zu große pullis! Playfully show some skin in this shiny blouse that's crafted from a sultry plunging collarline, a classy cold shoulder design, and long tiered flared sleeves covering the arms for the cool changing season. The tie detail and the fluttering flounce add much of fun to this top. And the adjustable slender shoulder straps can offer a suitable fit.